The local paper called Greg Sims' shot wind-aided, but it still put Sims' Salem Buccaneers up 1-0 in this April 1990 game. Sims then followed that up with a run-scoring double in the second, according to The Frederick News. Sims hit that home run and that double to start his third season as a pro. He saw just one more. He never made AA. 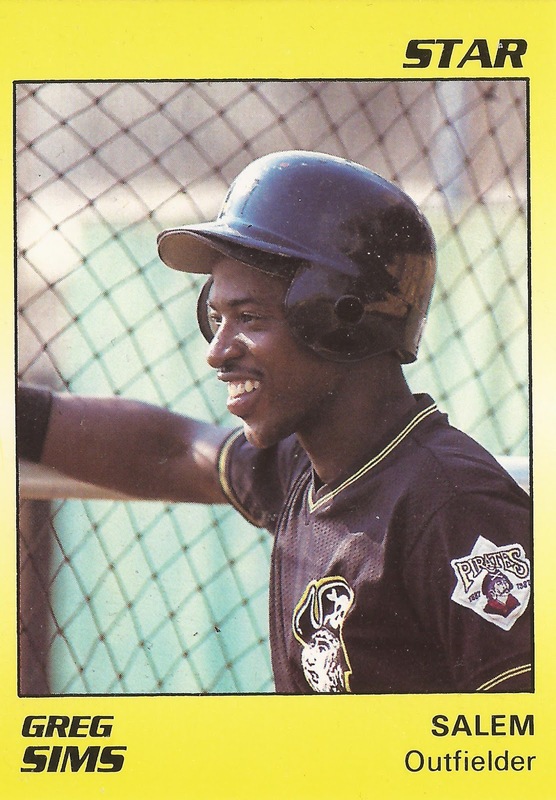 Sims' career began in 1988, taken by the Pirates in the 25th round out of St. Leo College in Florida. At St. Leo, Sims flashed his speed. He stole 188 bases over his career, still good for second-best in Division II baseball. He held the record himself until 2002. He hit .299, with 50 stolen bases his final year there. Sims continued running in the pros. Assigned to rookie Princeton, Sims stole 42 bases in 60 games. He hit .270. He moved single-A Augusta and Salem for 1989. He stole another 52 bases in 122 games that year. He then played at Salem full-time in 1990. He walked and scored in an April game, then picked up three hits in a July game. He hit .245 on the year and stole 31 bases. Sims moved to the Twins for 1991 in a trade. Assigned to high-A Visalia, Sims played in just four games to end his career.